Who was the original audience? What do we know about the audience? What do we know about the circumstances in which this book was written? What's the author's main message? Fortunately, the first verse of the Book of James gives us the answer to some of these questions. Not only does this verse give us some basic information about the background of the book of James, but it also presents us with our first opportunity to reflect on our commitment to Jesus. The Book of James, in general, challenges us to live out our faith. That is James's main message. He calls us to not only learn more about God intellectually by to put that knowledge into practice. Yes, we want to know how God sees the world, but beyond that, we want to then live according to that new knowledge. We want to live the way God wants us to live. Salvation is by faith alone, not by works. But if works - or a changed life - do not accompany our faith, James called that “faith” useless. While action is not a prerequisite to faith, it should accompany it all the same. So, how does James challenges to work out our faith in verse 1 of his epistle? Notice what he calls himself: A servant of God. James approaches us with humility and the clear understanding that God is his ultimate Master. James lived for God. James lived to serve God and our Lord Jesus Christ. Do you? Who are the 12 tribes? Genesis 49:1-28 tells you exactly who the 12 tribes are. They were the tribes of the nation Israel that descended from the family of Jacob. For the purpose of our study of the book of James - or of any epistle - it is of interest to note whether the audience was made up of mostly Jewish or Gentile believers. This background information comes in handy when James starts to reference things like “the Law”. Salvation is by faith alone. Does that mean we don't have to worry about our actions? No. James is writing to correct this line of thinking. Loving actions and obedience are still an important part of our faith. Does the attitude we see in James's audience sound familiar? Have you ever encountered this philosophy in today's world? You might consider the counter-statement: “The sinner's prayer is not a get-out-of-jail-free card.” Why do preachers emphasize this truth? Even in today's world, there are some who hear that salvation is by faith alone and take that as a permission to continue their misguided lives, maybe with a few faith practices sprinkled throughout. That is not the life that God wants us to live. James is about to challenge us to live the kind of life that reflects the heart of God. I can't wait to be challenged by his words. When we study an epistle, such as the book of James, we can usually find more background information about the audience - and sometimes about the author's interaction with the audience - in the book of Acts. We find this important background information on the book of James in Acts 8:1. To better understand what is happening here, read or skim the previous two chapters. Stephen, a faithful servant of God during the early-church years, proclaimed his faith in Jesus boldly and was stoned because of it. Understandably, this scared many of the believers who quickly took off and found other places to live. In other words, they witnessed this persecution and uprooted their lives to escape it. So, these Jewish believers began to “scatter among the nations”, as James describes it in verse 1. This background information will come in handy when we approach our first passage. James addresses their attitude towards tribulation and trials. Because we have looked at this audience's background, we now know that they have already experienced trials and tribulations in the form of persecution. These experiences are not new to them. 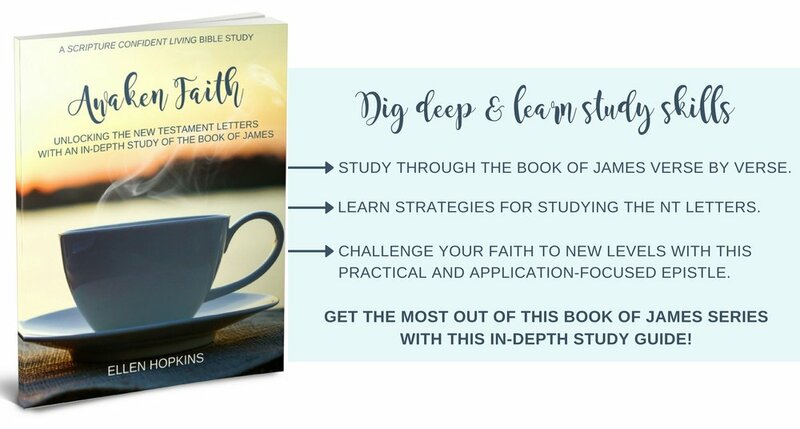 I have one last challenge for you as you begin to study the book of James: Read the whole book of James in one sitting. Whaaat? Am I crazy asking you this? No, not at all. It might sound like a daunting task, but it is much easier than you think. The book of James has five chapters and will likely only take you about 20 minutes to read in one sitting. If you really hate reading long stretches, you can always opt to listen to it. You can do so on sites like biblegateway.com or in the YouVersion app. A read-through like this has a few benefits. You are reading the book of James the way it was intended to be read. When James wrote this letter to these churches, he certainly did not mean for them to read a small portion a day and neither would the believers have approached the letter in this way. When we receive a letter in the mail even today, we read it all the way through in one sitting. We want to hear everything the sender has to say, and we want to see the full flow of thought. That is the second benefit. When we read the book of James in one sitting, we understand his thought process more clearly. We are not yet focusing on analyzing each individual challenge. Instead, we begin by understanding his overall message. We are going to repeat this exercise at the end of our journey through the book of James. We will read through it once now and then do the same at the end of our study. You will notice a huge difference. Now, you are reading this book with possibly little background information and maybe even for the first time. However, once we have studied the Book of James verse by verse and then read it through in one sitting again, you will remember all those nuances and new information that you learned while studying. It will bring you joy; I just know it. It will bring you Scripture confidence. During this initial read-through, focus on following James's flow of thought. Focus on the main message. Do not yet try to decipher details, ask questions, or wonder about an application. Did I really just tell you to not worry about an application? We will focus a lot on applications during our study of the book of James. We won't be able to help it! The Book of James is all about application. It's all about living out our faith. However, for now, just focus on seeing his main message and getting an overview of this book. Don't get distracted by questions or details. You will get to them later, I promise. With these preliminaries out of the way, we are ready to dive into the book of James. Tell me, did any light bulbs go off in your mind as you learned about the Book-of-James background? Do you have more clarity as we jump into the study of this epistle? Do you have any question before we begin? Let me know in the comments section below. Thank you for joining me for this background lesson. Come back Wednesday for more.